September 25, 2014 — My wife just wanted pho. Two weeks later she was running from a man in a clown mask and an animatronic corpse leaping from a casket. Last year, I discovered that a local haunt attraction called Fright Kingdom I’d heard about but never looked into was, quite literally, just across the graveyard from me. It also happens to be near our local pho place. My wife and I had a craving, so I got some carry-out. On my way back, I decided to see if Fright Kingdom had erected its façade yet. 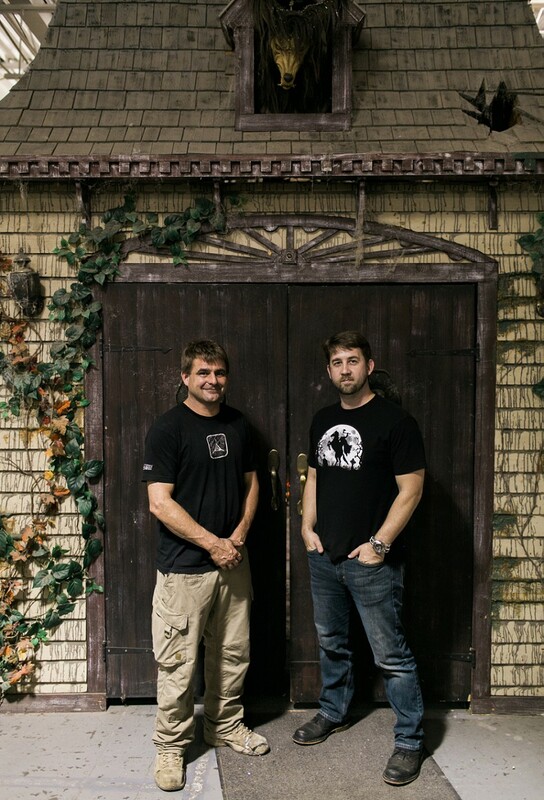 The haunt is located at 12 Simon Street in Nashua, New Hampshire, and from the road, it looks just like a warehouse. You have to drive into the lot, across a set of defunct railroad tracks, and around the back of the building to see the entrance. It’s impressive. A large dark castle juts out from the warehouse with the haunt’s name emblazoned in Halloween-orange letters on a battlement that towers more than two stories into the air. Around its base and inside the tower, like so many warnings to stay away, were skeletons bound to stakes and crosses. I pulled into the parking lot, took a quick snap, posted it on the socials, and the file ricocheted around the server farms until it came to the attention of the man who owned the haunt, Tim Dunne. He invited my wife and me over for a walk-through before the place officially opened on October 3. Dunne had dark hair and a black shirt, and looked like he was just off a construction site. Which he was…one strewn with victim viscera and monster secretions. I asked him when he erects the façade each year. “Oh, that’s up year round,” he said. The bricks, he told us, were made of compressed ceiling tiles and then coated with a sealant and painted. I rapped on one as we entered and it felt like actual building materials instead of the styrofoam-softness I was expecting, able to weather the harsh New England winters and pansy New England summers. Speaking of expectations, here is what I expected from Fright Kingdom. Even with that dramatic façade, I thought it’d be a quick walkthrough of a cobbled-together, quaint haunt that maybe got an A for effort but was not something you’d turn into a Halloween tradition. No. This is a major attraction. With heart. That I want to live at. 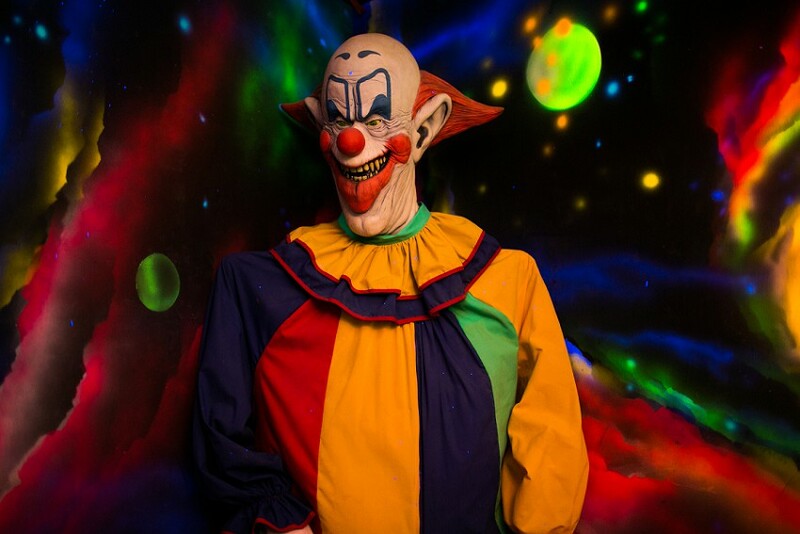 The place is vast—150,000 square feet vast, with five different haunts inside, plus staging areas and facilities for the staff. “We started 10 seasons ago in 17,000 square feet on the other side of the warehouse, and just grew,” Dunne said. The line doesn’t start until inside, where it wends in the shadow of a giant orange pumpkin on the wall. Once you get tickets, you walk through a short hallway…of live tarantulas. The tunnel glowed orange with the heat lamps in the furry arachnids’s terrariums. On the other side of the tarantula tunnel was what looked like the makings of an indoor carnival. There was a stage in one corner, where Dunne told us performers in costume entertained the audience, carnival games, spaces for face painting, a fortune teller, a snack shop, photo ops with life-sized movie monsters like Stan Winston’s Pumpkinhead (made from the original movie mold), and a custom vehicle created from a coffin, a la Herman Munster’s Dragula. “People love taking their pics with that,” he told us. There was also a burial simulator that ended up being part of my destiny. I’m going to have to revisit that experience in a separate piece. Dunne explained to us that the main purpose of this part of the haunt was to keep the size of the lines down. “If people are stuck in line, no matter how good your attraction, they’re going to find it not worth it.” He explained that each group of fifty gets a matching card pulled from sets of zombie-themed playing cards. They hang out, have a Halloween party, and wait for their group to be called. 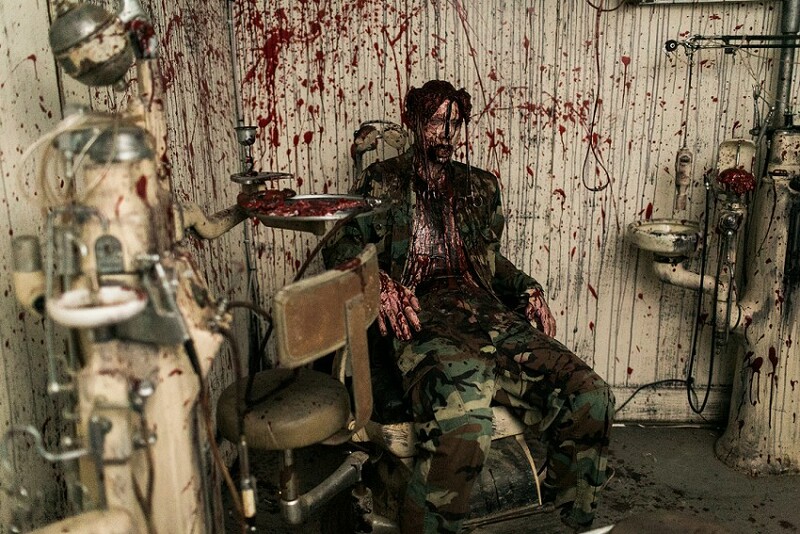 Finally, it was on to the first haunt, a zombie-themed maze called Apocalypse Z. As we entered, he explained how different it would be once it opened. Staff barking orders, the sounds of warfare, air cannon guns, real chaos. We stopped at a window where a computer generated scene played of a zombie feasting. “Watch this. You might want to put your camera down.” We didn’t have time to wonder if he was guarding a haunt secret, because the zombie looked up from its bloody feast and ran directly at us. In seconds it filled the screen…and a jet of water sprayed us, feeling for all the world like blood. I jumped. My wife screamed. That was when we learned that our visit would be a little more than a walk-through. Dunne had turned on all the sensors for the animatronics. 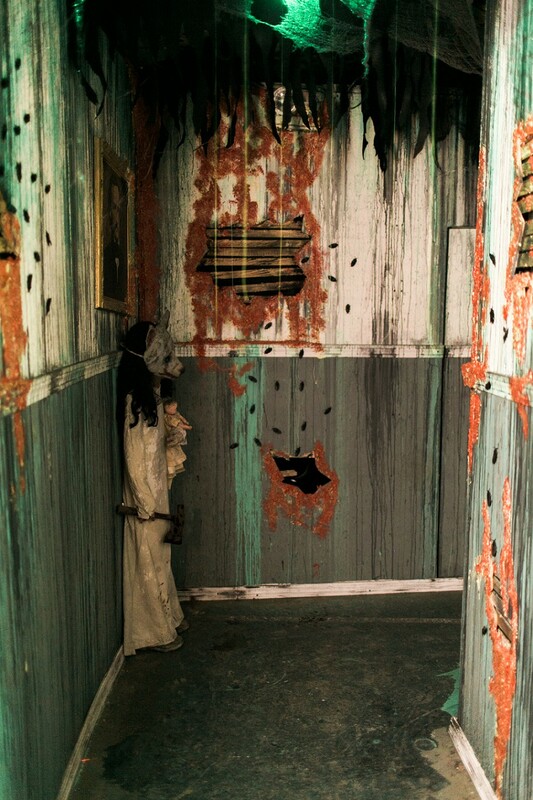 At one point, while we were staring at a terrible-looking creature at the top of a stairway, the stairs themselves opened and a live person jumped out wearing a mask. He’d gotten somebody to run around behind the scenes for us, as well. Of course, this broke every promise I made to my wife. I told her it would be like a casual stroll through a giant and ghastly work of art, nothing like the haunts that she loathed so much. Anyway, she ended up screaming a lot and I still have her fingerprints bruised into my forearm and most of our photos came out blurry, but it was worth it. Made the whole experience a lot more fun. For one of us, at least. Two counting Dunne. 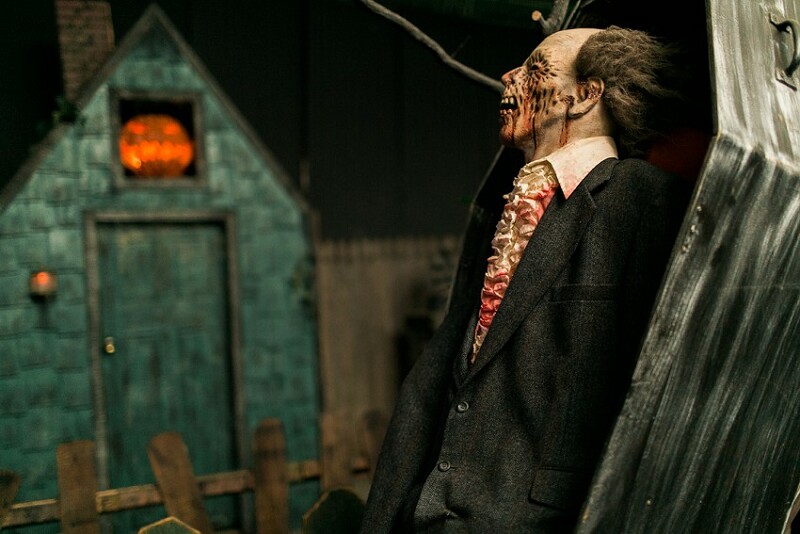 When the haunt is fully active, Dunne has some 100 performers running around the spaces behind the haunts, scaring people through hidden doors and fake panels, dashing through the secret hallways that encircle the individual haunts, wandering through the crowds in the staging areas. The next maze he called, “Bloodmare Manor,” a name he adapted from one of the early names of what would eventually be Disney’s Haunted Mansion. “This is my favorite, my baby,” he said. Dunne grew up in Florida, and the Haunted Mansion was one of the biggest influences of his life. 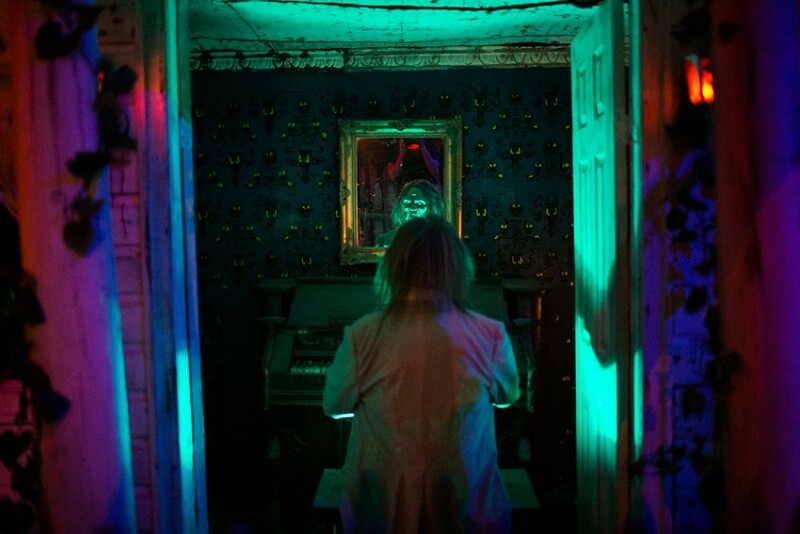 He excitedly recounted the time he won a video contest to play a butler in the Mansion, and many of the art and artifacts in the haunts were tributes to the Disney spook house’s various incarnations. Bloodmare Manor started out with nostalgically spooky stuff like a 1964 Cadillac hearse, an old ghoul on an organ, and an entryway inspired by Phantom Manor, the Disneyland Paris equivalent of the Haunted Mansion, complete with an animatronic werewolf head poking out a window. Eventually, it got bloody and disgusting, like a charnel house of cannibals. Blood everywhere. And the screams of my wife. 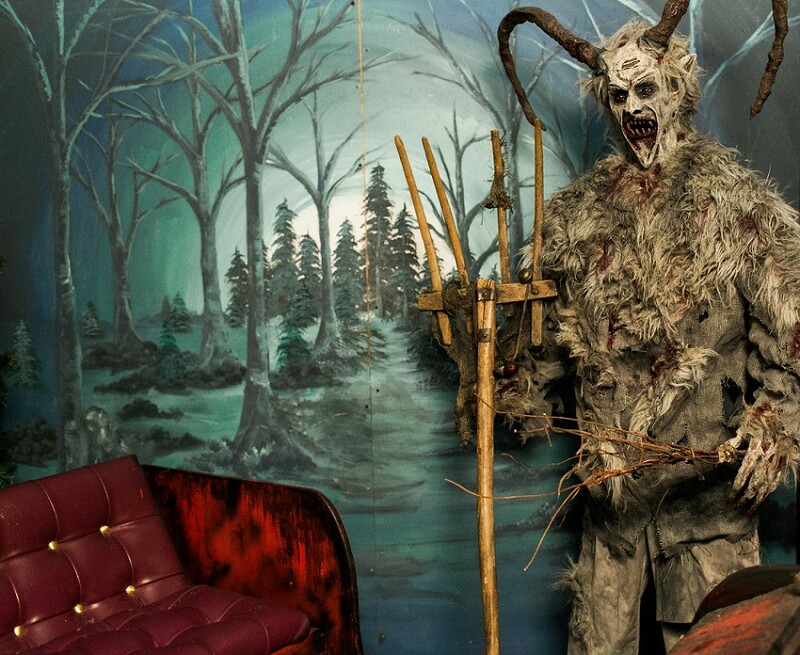 Throughout the tour, Dunne would point out various props, most of which were custom-made or adapted for the haunt. Turns out, Dunne has the perfect day job for putting together a haunt. He runs a demolition company. Which means when a local funeral home needs to come down, he walks away with the coffins. When an old high school building goes down, he gets all the shelves. It’s like recycling, but most of the benefit to the environment comes from scaring humans to death. Also, strangely enough, all the artifacts in Fright Kingdom basically make it a history of the area. The third haunt was Carnival of Corpses 3D. Before entering this colorful kaleidoscope of a maze, you put on a pair of 3D glasses, which makes the special paint applications on the walls and the figures and the props stand out in vivid, vivid neon. The effect was amazing, and done better than any of the 3D mazes I’ve ventured through in the past. My favorite parts of this haunt were the giant, two-headed yeti on display in the freakshow and the pair of Klowns straight out of Killer Klowns from Outer Space. After leaving through a vortex tunnel, we were on to Grim, his blackout maze, which is completely dark. We had to trail our hands along the wall to navigate, which was covered in slimy, disgusting textures. Dunne said that Grim was the easiest of his haunts to put together but one people seemed to talk about a lot. 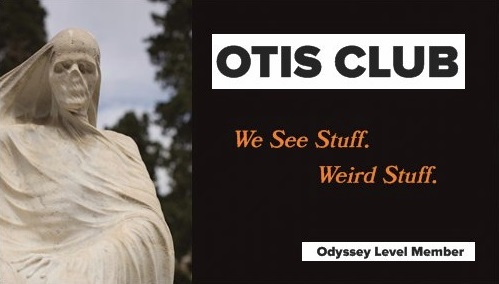 “Visitors tell me all the time they see things in here, demons and monster and such," his disembodied voice floated back to us through the pitch blackness, "but there’s really nothing in here like that. Just their imagination” After pushing through a disconcertingly tight hallway lined with large inflatable bladders, we entered the final haunt, Castle of Corpses. That final haunt exited out into an area where Dunne has a gift shop and some of his own personnel horror memorabilia on display. He also hosts celebrity appearances from horror movie stars there. Two large screens dominated the space, which bore feeds from inside the haunts, so you could watch other people getting scared. I want that cable channel so bad. For real. I was standing in the middle of 150,000 square feet of that passion. I can’t wait to go back when it opens. Speaking of which, Dunne gave me two pairs of VIP passes to hand out. 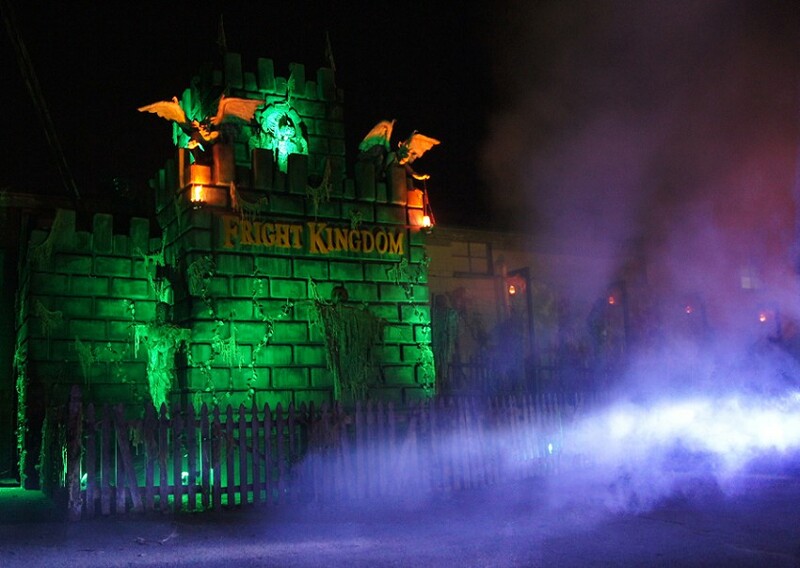 Just email me with the subject “Fright Kingdom” at ockerjw@gmail.com by the end of the day September 30. 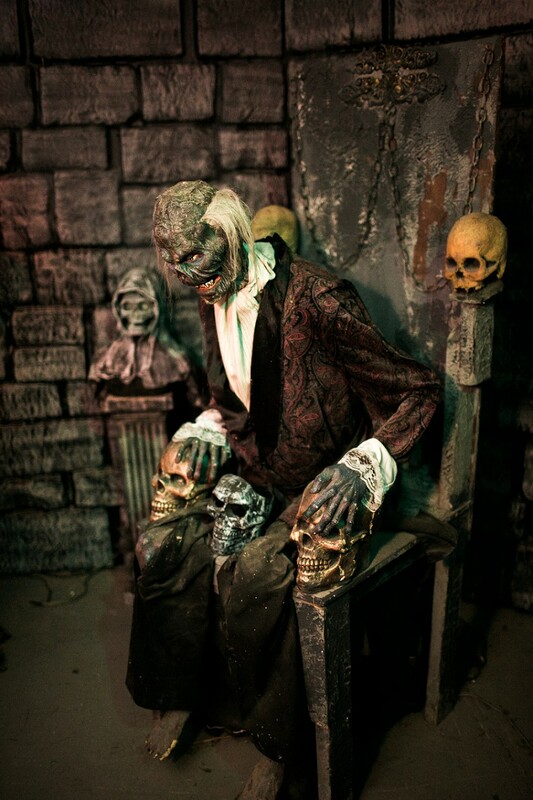 On October 1 (Fright Kingdom opens October 3), I’ll pick two of those emails at random. Obviously you need to be relatively local or visiting in October. I’ll express mail them to you or, if things work out, meet your personally for the handoff.